Now that sounds like someone I want to learn from! Taking this approach establishes a level of accountability and responsibility to one’s craft. I’ve read three of the six YDKJS books completely and skimmed through the other three. There are some really difficult concepts covered that take a couple times reading through to fully grasp. Concepts like closures, modules, ‘this’, prototypes and async to name a few..
What’s the point of this post?? I plan on writing a series of blog posts that work through these concepts and explain them at a basic level. Do I think I can explain these better than the author? Absolutely not, so I encourage you to read the books (in addition to my blog, of course). I am, however, doing this for two reasons. Second, it’s an exercise in rubber ducking. And what the hell is Rubber Ducking?? 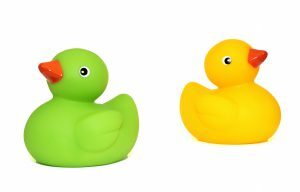 If you haven’t heard the term, rubber ducking is a technique by which you try to understand something by explaining it to a rubber duck. So rather than just read through these books for a second time, I’m going to work through them and try to teach these concepts so they might be understood by a beginner. The purpose of this post won’t be to walk through the algorithms and explain everything that’s going on, but rather to emphasize how different two answers to the same problem can be. Codewars, as I’ve mentioned in previous posts, is a great way to practice solving algorithm challenges. It can be pretty humbling at times, though, because after you solve the problem, you have the opportunity to look at other people’s solutions. The upside to this, and, in my opinion, the real strength of Codewars, is that you can learn from these solutions… I’ve only done a handful of algorithms on this site so far, but I’m going to show my first and last solutions as examples of how things can improve. The first algorithm I solved at Codewars was called ‘Decode the Morse code’. Try not to laugh…. In this kata you have to write a simple Morse code decoder. While the Morse code is now mostly superceded by voice and digital data communication channels, it still has its use in some applications around the world. The Morse code encodes every character as a sequence of "dots" and "dashes". For example, the letter A is coded as ·−, letter Q is coded as −−·−, and digit 1 is coded as ·−−−. The Morse code is case-insensitive, traditionally capital letters are used. When the message is written in Morse code, a single space is used to separate the character codes and 3 spaces are used to separate words. For example, the message HEY JUDE in Morse code is ···· · −·−− ·−−− ··− −·· ·. NOTE: Extra spaces before or after the code have no meaning and should be ignored. In addition to letters, digits and some punctuation, there are some special service codes, the most notorious of those is the international distress signal SOS (that was first issued by Titanic), that is coded as ···−−−···. These special codes are treated as single special characters, and usually are transmitted as separate words. Your task is to implement a function decodeMorse(morseCode), that would take the morse code as input and return a decoded human-readable string. The Morse code table is preloaded for you as MORSE_CODE dictionary, feel free to use it. In Java, the table can be accessed like this: MorseCode.get('.--'). In C#, the preloaded Dictionary can be accessed like this: MorseCode.Get('.--');. All the test strings would contain valid Morse code, so you may skip checking for errors and exceptions. So, in thinking about the solution to this algorithm, I immediately pictured various ‘for’ loops to split the Morse code into words, then letters. Then I could replace the Morse letters for real letters and reassemble the message using more ‘for’ loops. First, if you use these solutions to learn from, you can get more clever with your own solutions, and in the end, make yourself a better programmer. Here’s an example of an algorithm I submitted a couple days ago. Write an algorithm that takes an array and moves all of the zeros to the end, preserving the order of the other elements. For instance, looking at the answers to this algorithm reminded me that the array.filter() method doesn’t change the array on which it is called. So, once I filtered the non-zero values into a new array, I still had the original array to work with. I could have used it again to add the zeros to the end of the new array. Hopefully, next time I come across a problem like this I’ll remember the more elegant solution. In my experience, learning a new skill, especially one as difficult as programming, is all about repetition and practice. So I encourage you (and myself too) to use sites like Codewars to practice these skills over and over. I also encourage you to take the time to look through other people’s solutions and learn from them. It’ll probably help with your approach to your next one. The second point I want to make is that the shortest solution isn’t necessarily the best solution. We can argue that ‘for’ loops are actually faster than native functions like array.filter() and array.map(), and they are, but that argument is mostly semantic. Unless you are writing an application that demands extremely high performance, it is unlikely that the user will see a difference between the two. I believe, therefore, that prioritization should be placed on the readability of the code you write. Going through the process of teaching myself how to code, I’ve read many examples of code written by others, and can say for certain that all code is not created equal. Some code is nicely written and readable… Other code is like a plate of spaghetti and impossible to decipher. Let’s go back to the answers to the first algorithm. My code, while drawn out and overly complicated, is fairly easy to follow. The last two solutions listed, while being the shortest, are not that easy to read (at least to a newbie like me). I’d argue that there’s gotta be a happy medium, maybe something like the one written by czyzykowski. Their solution is logical, modular and very easy to follow. Feel free to comment below if you disagree, like I said, I’m still new to this, so maybe those last 2 examples are perfectly readable to someone who’s been at this a while. Read code others have written and keep writing more of your own. Before you know it, you’ll look back at code you wrote a while ago and realize just how far you’ve come!! Football season started for my two boys, they started school this week and my wife went back to work this week!! Hopefully, now things will start to settle down a bit. Anyway, enough about that, let’s talk about what we’ve accomplished this summer and what we want to accomplish this fall…. As I mentioned in a previous post, I finished the front end certificate at Free Code Camp in July!! I decided to work on the Back End Program at FCC, then jump back and complete Data Visualization. Thus far, the back end has been difficult, but enjoyable. It’s been difficult in that I’ve really had to change gears in my head. Node.js and working on the server side have been completely different than any other coding I’ve done in the past (granted, it’s a fairly limited past as far as coding is concerned). I started the back end program by working through the Cloud9 modules for Git, Node.js, Express.js and MongoDB. If I’m being honest, I found these modules to be pretty useless… I didn’t learn much from them, and half the time I wasn’t even sure what they were asking me to do. As a beginner, I think it would have been more useful to have a better intro to the languages and better explanations as to what I was trying to do with them. Intro to the very helpful Ninja! Speaking of actually learning, I found a very helpful tutorial series on YouTube called Node JS Tuturial for Beginners by the Net Ninja. I may have mentioned this guy before and I highly recommend these videos if your starting out learning the back end. There are quite a few videos in the series, but each one is short and to the point and very easy to understand. I watched each of the videos and worked along side them in building a ‘To Do’ app in the last 7 or 8 videos. In addition to a great intro into Node.js, one of the cool tangential things I learned from this series was working with Atom. The ‘Ninja’ takes you through the steps of setting up Atom, installing Node, npm, etc. I’ve been working in Atom ever since and find it a much better environment to develop the back end projects than working on Cloud9. At the risk of sounding a little naive and corny, learning how servers work has opened my eyes to the potential you have as a full stack developer. I feel like I learned a ton in the Front End program but I always had a nagging in the back of my head like, ‘yeah, these new skills are great, but how do I actually use this to build something bigger than a one page app??’. Working with Node and Mongo and everything else involved in the back end program (yes, even Git) has calmed that nagging a bit and given me a sense of the bigger picture. At this point, in addition to the Cloud9 ‘learning’ modules, I’ve completed 3 of the 5 API projects. Feel free to check out my Timestamp Microservice, Request Header Parser Microservice and URL Shortener Microservice. You can find the code for all these apps on my GitHub page. Please feel free to comment below with any suggestions or questions about my code. First and foremost, I’ll be working towards completion of the Back End Certificate. I plan on finishing up the last two API projects then moving right on to the full stack ‘Dynamic Web Application Projects’. In addition to the Free Code Camp projects, I’ve continued listening to tech related podcasts. I mentioned most of the ones I’m listening to in a previous post, but have picked up a few new ones as well. Two of my favorite new ones are FiveThirtyEight Elections Podcast and IoT Podcast. As I’ve been working through the back end program at FCC, I’ve been trying to think of ways to start applying what I’m learning in the real world. One idea that I’ve been giving a lot of thought to lately is the internet of things (hence the IoT Podcast). The internet of things, if you don’t already know, is a broad term that describes all the real word items (refrigerators, cars, wearables, thermostats, etc, etc, etc) that are hooked up to the internet and can be sensed and/or controlled remotely, the so called ‘smart’ items. Just yesterday I ordered a beginners kit that includes a board and a bunch of sensors and motors so I can start playing around with this stuff. I’m really excited about it and one of my sons wants to get involved too, which makes it even better! A friend of mine, Serg Chernata, just started a blog called ‘Bits & Pieces‘, where he’s going to discuss a bunch of tech related topics, including his experiences with IoT. In fact, his first post was about setting up a Raspberry Pi as a home server to host his blog. I’ve included a link to his blog on the sidebar of this site under ‘Recommended Blogs’. I’ll keep adding to this list as I come across sites that I find interesting and useful. Once again I’ve written a much longer post than originally planned, which is not easy for someone who says so little in the real world! Hopefully, if you’re still reading, you got something out of this. 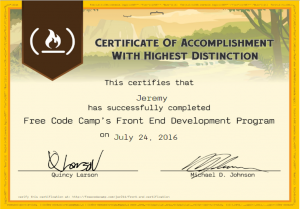 Front End Certificate at Free Code Camp – Complete!! Five months and one day after I discovered Free Code Camp, I’ve completed my Front End Certificate. A couple thoughts on the process…. When I discovered Free Code Camp, I rolled up my sleeves and began the front end development section with tunnel vision, focused only on completing the certificate. Along the way, my focus broadened… I began to realize that this process isn’t just about completing a certificate, but becoming a strong developer. To that end, I searched for additional resources to supplement the Free Code Camp curriculum. I covered a lot of these resources in a previous post, but mostly it involved listening to podcasts, reading books, watching YouTube videos and practicing algorithms. I’m an introverted guy and generally keep my thoughts to myself, so expressing myself in these posts isn’t exactly second nature. I think, however, that doing so has significantly enhanced what I’m getting from this process (and hopefully helped at least a couple others in return). I’ve also found that trying to explain the solution to an algorithm is, in many ways, much harder than writing the solution itself! I think this has certainly helped strengthen my coding skills and plan to continue working through the solutions to many of the freeCodeCamp algorithms and projects here at crookedCode. So, if you find yourself getting frustrated with your progress in your own learning to code journey, take a step back and ask yourself what else you could be doing to broaden your learning experience. And finally, I want to say – Learning to code is hard! This journey has been difficult in many ways I could not have predicted at the onset. First, of course, learning a new skill (any new skill) can be difficult. Coding is certainly no exception, in fact, I’d argue just the opposite. I feel the difficulty is often overlooked in the many articles (at least the ones I’ve read) that proclaim everyone can learn to code. Many of these articles fail to mention that it’s going to take a lot of work and a lot of extremely frustrating, trying moments, especially if you’re teaching yourself. I’m not arguing against the idea that people should learn to code… If learning to code interests you, then by all means, let nothing stand in your way. Before you start, however, make sure that it’s something you really want to do and make sure you’re prepared to commit the time and mental energy to accomplish your goal. It seemed like there was something going on every night and throughout the weekend, so whenever there was a break, I would try to put some work in. I’ve got to say though, that pace is unsustainable if you value your mental health and the happiness of your family. Since baseball has finished, I have blocked off two evenings and one day on the weekend that I devote to learning to code. Everything else (at least when I’m not at my full time job) can be spent with family or catching up with stuff around the house. If you are learning to code and have other personal commitments, I highly recommend blocking off a schedule of when you plan to work. Otherwise, you always feel like you should be working and everything else in your life takes a back seat, and suffers because of it…. Of course, there are other things like maintaining self-confidence, battling impostor syndrome, deciding what to learn, setting up a development environment, etc., etc. but this post is already longer than I had planned. Just know that if you are struggling in your journey to learn to code, you are not alone, there are plenty of us out there in the same boat. I started my learn to code journey in late February, 2016, when I signed up for freeCodeCamp. So it’s been about 3 1/2 months and I figured this was as good a time as any to share my thoughts, progress, tools that I’ve found valuable, etc, etc. I’ve been doing drug discovery/pharmaceutical research for nearly 20 years. Last year, I found out that my job was moving to a different part of the country and for many reasons, not the least of which was apprehension over relocating my two sons, we decided not to make the move. Stumbling on that Sivers post was just what I needed and I’ve since become a huge fan of his. If you haven’t read or watched anything by Derek, do yourself a favor and check out his site. He has a unique perspective on life that’s completely refreshing when compared to most of what you encounter in the world today. Looking back at the last 3 months, it’s hard to put into words everything I’ve gone through in learning to code. So far the journey has been fun, frustrating, time consuming, enlightening, tiring, exciting, stressful, rewarding, humbling… Basically, it’s been a roller coaster ride. It seems like one minute I feel like I’m on top of the world and that I can do and create anything. Then the next minute I feel like a total idiot and don’t know anything. Then genius again, then an even bigger idiot than before… You get the picture. For the time being, I still have a full time job (and coach my son’s baseball team) so I don’t have as much time as I’d like to devote to coding. I’ve put in a lot of late nights and weekends and, despite the two huge time commitments mentioned previously, feel like I’ve been able to make a ton of progress. I’m nearing completion on the Front End Development Certificate at freeCodeCamp. I’ve completed all of the Algorithm Scripting Challenges and most of the Development Projects. The only projects that I have left are to finish my Tic Tac Toe game, then build a Pomodoro Clock and a Simon game. These, obviously, will take some time, but I should get them done within the next month or so. You can check out my projects on my Codepen page. I’ve also started on the Back End Development Certificate. The first lesson was on Git, then you get right in to Node.js and Express.js. The biggest thing I’ve learned so far on the back end (in addition to reinforcing once again that I’m an idiot) is that I need to become comfortable in the command line. Thoughts on Free Code Camp thus far.. I feel that freeCodeCamp, in providing projects with increasing levels of difficulty, provides a great path to follow in learning to code. On the other hand, I feel some of the learning modules are lacking. For instance, having gone through the git and npm learning modules at the beginning of the back end certificate, I don’t feel like I learned much and have little more understanding of how to use them now than when I started. I don’t think, however, this is a negative for freeCodeCamp (and not sure if it was purposefully constructed this way or not). After all, what is the purpose of freeCodeCamp?? To prepare you to become an employable full stack web developer? Part of this whole process is learning to become resourceful and knowing where and how to look for answers when you run into problems. Something at which I’ve become increasingly skilled. Is it frustrating to pause in the middle of a project to go look up how to code something? Absolutely. Over and over again? Yup… But in the end, I’ll be a much stronger programmer for it. In a previous post, I mentioned some of the resources I’ve been using as I make my way through the front end cert at FCC. In addition to these, I’ve been broadening my knowledge of software development in general through the use of other sites, listening to podcasts and constantly searching for ways to learn (including starting a blog!!). One of the other sites I discovered is Codewars. Like I said before, I’ve also gotten in the habit of listening to podcasts on my commute to and from work. As I said before, I’ve used a lot of the tech websites (Mozilla, Stack Overflow, W3schools, etc) to learn as I went through the Front End course. I’ve decided to try something different on the back end. I signed up to audit a Node.js course on coursera. I can’t give any feedback on how useful the course is or whether it will help with the back end cert at FCC, as I just signed up for it yesterday, but I’ll be sure to write a future post about it. While listening to the tech podcasts mentioned above, I kept hearing, over and over, the advice to create a blog. So I did… And I’m happy I did. I have no idea how many people this blog will reach in the end, but one of the great benefits of it has been in reinforcing everything I’ve been learning. I know one of the best ways to really learn something is to try to teach it to others, but I didn’t realize just how true this was. As for advice on creating the blog itself, Simple Programmer (John Sonmez) created a great, and free, blogging course that walks you through the steps of creating a blog. If you’re considering creating your own blog, I recommend signing up for his course, it’s what I used to get started. On the remote chance that anyone has stumbled on this blog, and on the even more remote chance that you’re still reading, let me leave you with this.. If you’re on your own journey in learning to code, you are going to go through some rough patches and getting though those times are going to be extremely difficult. My advice is this… Don’t take the easy way out, it’ll just lead to more rough patches. What I mean by that is if you are looking to solve problem x, or write some code to accomplish y, the easy way would be to google it, find some code that someone else has written, copy and paste it into your project and move on… This may solve your short-term problem, but will get you nowhere in the end. There are several sites that I use frequently in learning to code. Obviously, freeCodeCamp is the main one. As I mentioned in my first post, I am currently working through the front end development certification at freeCodeCamp and highly recommend it. While working through the freeCodeCamp curriculum I use w3schools, MDN and Stack Overflow extensively as references. I also found that Tutorial Republic is an excellent resource for HTML, CSS and Bootstrap (which is a powerful front end framework that makes creating responsive web pages much easier). Now, to cover some terms we’ll be using frequently. In future posts, I will have to assume a basic understanding of these languages, otherwise each post will be the length of a book. So I urge you, if you have any questions about the concepts listed below, please use the resources listed above to read more about them. The above statement created a variable named ‘a’. It also includes a comment… Anything written on a line after // is a comment and will be ignored by the browser. You can also assign values to the variable when you create it. The following statements create variables and assign values of the various data types. This example calls the addOne function and passes the number 5 as an argument. This function call would return the value 6. What is an argument? An argument is the actual value that you pass into the function, as opposed to a parameter, which is the name listed in the function definition. I’ll be using these terms interchangeably here at decipheredCode (whether right or wrong…), so you can think of both arguments and parameters as something that gets passed into a function. Now… This has been a long, rambling post that mentioned a bunch of things but didn’t really explain anything in detail. I feel, however, that it was necessary before I started digging any deeper.. Hopefully, this will be helpful to someone just starting out on their journey to learn to code. The next posts here at decipheredCode will start to dig into real problems. Meantime, I urge anyone that is interested to check out the links that I mentioned above and to start getting their hands dirty by writing some code!